Level design way too confusing, though the core mechanics are fun. FPSs have come a long way since Doom. Was terrific fun as a kid. I went to a computer section of our county fair to play this with my friend. There is nothing quite like shooting demons with the smell of farm animal in the air. 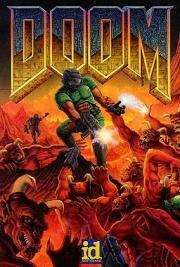 Original Doom was my first entry into solo FPS games. I spent a summer at my aunt's house playing this game, learning the secrets. And when I got home, I found a great Doom clone that I then played the hell out of for the next year. Solid, though there are far better options now. I've bought this game so many times on so many platforms and every time I play it, I enjoy it. It's a masterpiece to me, and it shaped the future of gaming. Love it. I don't know if this was actually the first FPS, but it definitely defined the genre. Overly simplistic on a mechanical level by modern standards, but makes up for this by having great level design and awesome enemies. This game defined an entire genre of gaming for good reason, and today it still holds up pretty well if you can tolerate how awkwardly it controls in contrast to modern shooters. The original and proper Doom. I'm the demon on the bottom left of the cover whispering to you to try the brutal doom mod.